Are you a lonely freelancer? When feelings of isolation are getting you down, joining an active coworking space might be a great way to boost your business and morale. While the advantages of a freelance lifestyle usually far outweigh the disadvantages, one of the most frequent complaints among freelance professionals is a sense of loneliness. A study in the UK discovered nearly one third of self-employed people (stats) struggled with feelings of isolation. And this figure is likely even higher for solo freelances working from home. Coworking spaces are an ideal middle ground between the quiet solitude of home and the energy of a busy office. They afford the lonely freelancer a space in which to feel part of a tribe while at the same time allowing for complete freedom of choice when it comes to attendance and participation. It’s for this reason, among many others, that coworking spaces are increasingly popular settings for freelancers and nomadic solopreneurs. 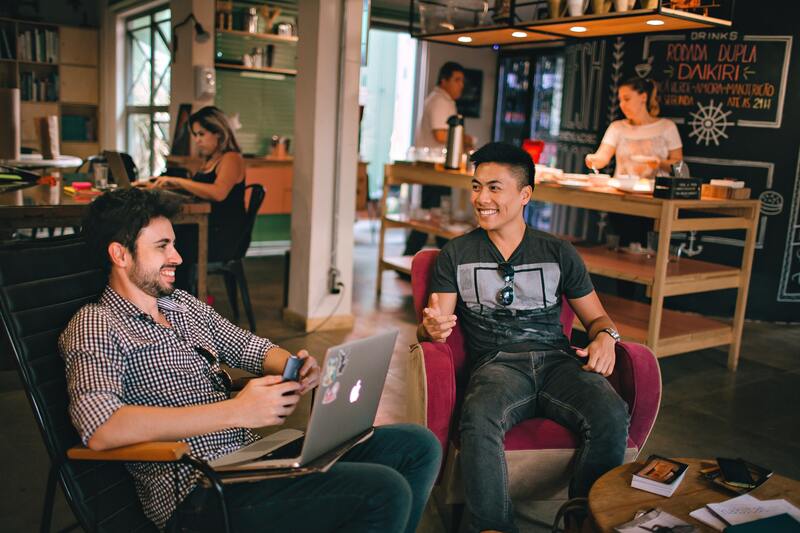 If you enjoy working for yourself but often feel sluggish and a little down, then seeking out a local coworking environment might just be what you need. Here are 7 more reasons why coworking might be for you. As social beings, most of us need human interaction at least some of the time (even introverts, who require solitude in order to recharge their batteries). Long hours in a home office can be wonderful but it can also be draining. Chronic loneliness leads to anxiety and depression, which negatively impact on business success, relationships, and even physical health. A coworking space provides a place to meet new people and also build long-term bonds with familiar faces. This can be especially beneficial if you work from home and you’ve just moved to a new location. For freelancers, the isolation of building and running a freelancing business can be crippling. There’s a lot of doubt, fear, uncertainties, and unknowns to deal with. Without a support network of some kind, these negative thought patterns can spiral out of control and wreak havoc with your business and career choices. In a coworking space there will be people who freelance or run their own businesses. A sharing of experiences, advice, and just general friendship, can go a very long way to boosting the moral of a lonely and scared freelancer. It’s not just freelancers and solopreneurs who use coworking spaces. Many startups also make use of collaborative offices. Big corporations allow – and even encourage – some of their staff to work off-site in a coworking space. The lower rental costs off these spaces also attract non-profits. For a freelancer, a coworking environment can be a great place to meet new potential clients. Whether fellow solo professionals or the marketing and sales staff of a big firm, there are a lot of potential clients to be found popping in throughout the day. As well as potential new clients, there are also potential new business partners to be found in a coworking space. Whatever your specialism or skill, there will be fellow professionals who might make excellent partners for collaboration and/or delegation. For example, a freelance marketer might meet and team up with a talented freelance graphic designer, a virtual assistant, and even a bookkeeper. If not directly collaborative, then the relationship benefits can be based around referrals. You can end up getting to know a group of disparate yet complementary professionals who can really boost your business. And with Invoice Ninja’s wide choice of app integrations and synchronizations, you can be collaborating together within a few minutes. Working from home is comfortable but it’s not exactly a professional look in the eyes of clients. Seeing a kitchen or bedroom wardrobe in the background during skype calls and video conferences can potentially be detrimental to your brand, depending on your line of work. Coworking spaces allow you to make calls, host video chats, and even invite prospects and clients for meetings on-site. A well-designed and smart coworking interior, with fellow professionals working busily in the background, makes you look more professional and serious about what you do. The client is also likely to assume this is your permanent set-up. Many coworking spaces organize events each month as a way to market themselves and increase revenue. These events target business owners just like you. They are a great way not just to meet even more people but also to engage in further education opportunities. Events can range from talks and workshops (on marketing, for example) to fitness sessions and excursions to places of interest. If you’re a nomadic freelancer, then traveling from one coworking space to another, in different countries, will open you up to many different types of interesting events and educational activities. This is also a great way to meet new people in a new place. Home is filled to the brim with temptations. For work-from-home freelancers and solopreneurs, there’s always something to distract the mind from the work at hand. There’s daytime TV, Netflix on the laptop, washing-up to do, a cat to cuddle, a cookie jar to open, or a bed to nap in. One of the biggest problems freelancers face is trying to stay motivated and productive when sitting in their pajamas. A coworking space forces you to focus. There are fellow professionals busily running their businesses right next to you, so the last thing you’ll be wanting to do each day is look lazy and unfocused. A coworking environment, while also fun and playful at times, focuses your mind on the important tasks at hand. It can also keep you from wallowing in self-pity, which is all too easy when alone. If you’re a lonely freelancer and you love working around other people, then a coworking space is going to offer a big boost for you and your business. Chronic solitude can eat away at your morale and health. In this day and age, with coworking spaces popping up in just about every city, and easily findable via dedicated coworking platforms, there’s really no excuse not to join. Most coworking offices are very affordable and many provide a diverse range of facilities including parking, lockers, showers, fast internet, food, cooking areas, chill out rooms, printers/scanners, and much more. Loneliness is painful. A social coworking space might just be the perfect solution to give your work-from-home freelancing business a much-needed boost.